Where is the Capital of Rhode Island? 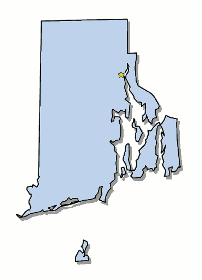 The Map of Rhode Island (RI) shows the location of the state capital in the "Ocean State". county, that has 5 counties, and the capital of the State is Providence. On a map, the capital city is always indicated by a star. Interesting fun facts about Providence including its history, location, county, current population, size of the city and the nickname of Providence, Rhode Island. The "Ocean State" map provides an outline of the state, which covers 1,045 square miles. The size of the state's capital city, Providence, is 20.5 square miles. Test your recognition skills of the map of the state, and knowledge of its capital, with our State Maps Quiz Game. The location of Providence is in the central-eastern part of the state, in Providence county at the head of Narragansett Bay along the Providence River. The city is located in Providence county, Rhode Island. Each of the 50 states have their own capital city. The city of Providence is the capital of the state of, Rhode Island. The capital does not have to be the largest city in the state, but is usually centrally located either geographically or by population. 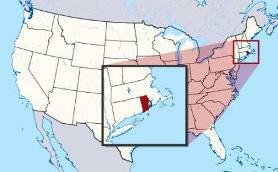 The State of Rhode Island is located in the North east United States on the Atlantic Ocean. Fact 3: The population of the capital city - 178,432. Nickname "America's Renaissance City"
Fact 5 on History: It was founded by Roger Williams in 1636, after he was exiled from Massachusetts. He was joined by many other religious dissenters. Fact 6 on History: The name was given by Roger Williams in gratitude for "God's merciful providence." Fact 7 on History: The devastating King Philip's War (1675 - 1676) erupted between the colonists and the Native Americans in New England and many of its buildings were burned down during the conflict. Fact 8 on History: It citizens played an important role in the American Revolutionary War (1775–1783). Fact 9 on History: It was incorporated as a city in 1831 and became the sole capital of the state in 1900. Prior to this time it had shared the title with Newport from 1854. The number of people, or the population of the capital city of Providence, obviously changes constantly but the government statistics for the 2012 population of Providence was 178,432, which provides a good indication of the number of inhabitants of the city. We hope that the interesting facts and information about Providence will help kids and school children with their homework. Learn more by playing the States and Capitals Game. Providence Nickname "America's Renaissance City"